FILE INFO: Pattern is 12 pages long and 6.8 MB. Pattern is charted and includes instructions for all stitches and techniques. Payment by PayPal or credit card through PayPal is accepted. You do not need to be a member of PayPal to pay by credit card. Upon completion of payment, you will be redirected to a download page. You will also be emailed an expiring download link. Please note that if you pay with a PayPal E-check, your download will be delayed until your payment clears. 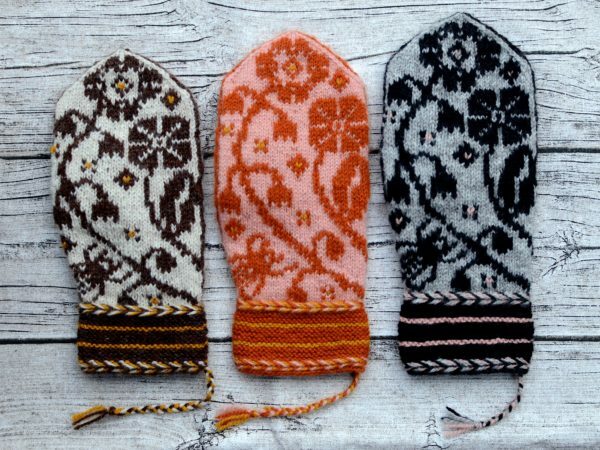 You do not need to be a member of Ravelry to purchase through them. If you are, this option allows you to store the pattern in your library. Should you have any trouble with the download or lose your pattern, please contact me. Actual Measurements: 8.5” (9”, 9.5”, 10”) circumference. To Fit: Choose a size that’s about 1” larger than the circumference of your hand, measured around the palm, not including the thumb. Lining Yarn: Shibui Knits Cima, 50g/328 yards (300m), 1 skein Pollen. Needles: Size 1.5 (2.5, 1.5, 2.5) US, 2.5 (3, 2.5, 3) mm, or size needed to obtain gauge. Pattern may be knit on double points, a long circular for magic loop, or on 2 circulars. You will also need a set of needles 1mm larger than your main needle for knitting the braids. 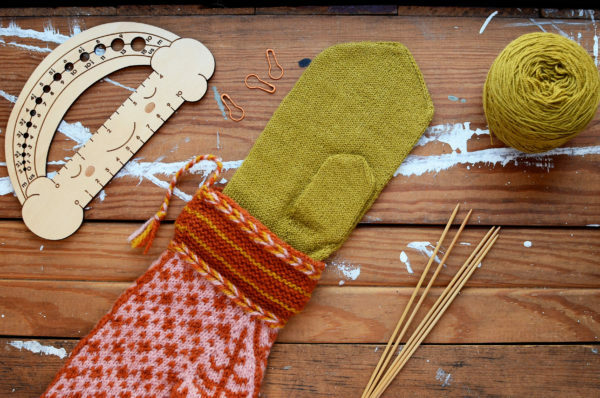 Notions: Stitch marker, ruler, smooth waste yarn for thumb gusset holder, darning needle. 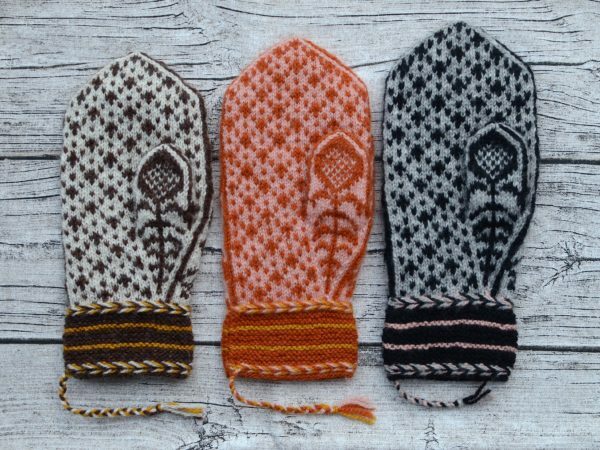 Outer Mitten Gauge: 30 (28, 30, 28) stitches and 32 (30, 32, 30) over 4” 10cm in pattern. Stitch gauge is more important than row. No one wants a tight mitten! Lining Gauge: 34 (32, 34, 32) stitches over 4” 10cm in stockinette. 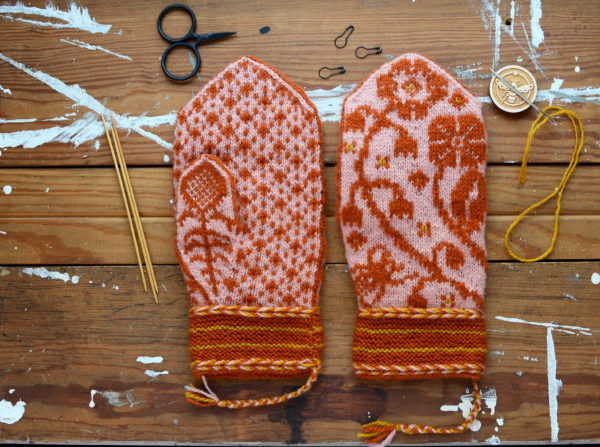 Notes: Finished mitten size is determined by gauge/needle size in addition to which size chart is knit.